“Shuffle,” the first part of Sanford Biggers’ trilogy, is shown outside the Everson Museum. 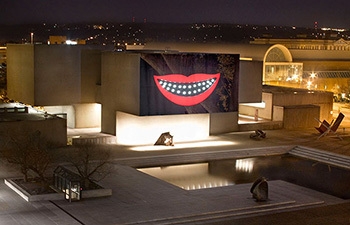 “Shuffle” and “Shake” will be exhibited at UVP’s Everson venue, a year-round outdoor projection onto the north facade of the Everson Museum of Art located in downtown Syracuse. The projection runs every Thursday through Saturday from dusk to 11 p.m. As part of the exhibition, Biggers will give an in-person artist talk on Tuesday, Nov. 11, at 6:30 p.m. in the Everson’s Hosmer Auditorium. The talk will be followed by a reception on the plaza. Biggers’ talk is presented in collaboration with the College of Visual and Performing Arts Visiting Artist Lecture Series. “Shuffle” and “Shake” form the first two parts of Sanford Biggers’ Odyssean trilogy about the formation and dissolution of identity. “Shuffle” explores the struggle between our own perception of self vs. others’ projections onto us. “Shuffle” also examines how we matriculate through society, often masking our insecurities, pain, longing and the internal schizophrenia of the id. The original soundtrack is composed from the artist’s field recordings made in Indonesia. Both videos feature Ricardo Camillo—a Brazil-born, Germany-based choreographer, stuntman, clown and DJ. 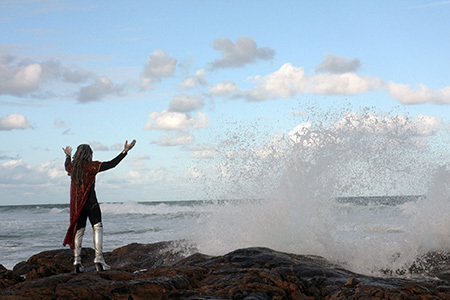 In “Shake,” the second video of the trilogy, Camillo walks from the favelas (or shantytowns) of Brazil, to the ocean before finally transforming into an androgynous silver-skinned figure. Biggers’ imagery and narrative simultaneously reference Greek mythology and the quintessential afrofutrist aesthetics of Parliament Funkadelic. Biggers creates artworks that integrate film, video, installation, sculpture, drawing, original music and performance. He intentionally complicates issues such as hip hop, Buddhism, politics, identity and art history in order to offer new perspectives and associations for established symbols. Through a multidisciplinary formal process and a syncretic creative approach, he makes works that are as aesthetically pleasing as they are conceptual. In “Shake,” the second part of Biggers’ trilogy, the main character walks to the ocean. Biggers’ recent solo exhibitions include the Brooklyn Museum, Sculpture Center and Mass MoCA. His work has appeared in venues worldwide, including Tate Britain and Tate Modern in London; the Whitney Museum and Studio Museum in Harlem; the Yerba Buena Center for the Arts in San Francisco; and institutions in China, Germany, Hungary, Japan, Poland and Russia. He has been a fellow of the Creative Time Global Residency, the Socrates Sculpture Park Residency, the Lower Manhattan Cultural Council World Views AIR Program, the Eyebeam Atelier Teaching Residency, the Studio Museum AIR Program, the P.S. 1 International Studio Program and the Skowhegan School of Painting and Sculpture residency. His works are included in the collections of the Museum of Modern Art, Walker Art Center, Whitney Museum, Brooklyn Museum and Bronx Museum. Awards include the American Academy in Berlin Prize, Greenfield Prize, New York City Art Teachers Association Artist-of-the-Year, Creative Time Travel Grant, Creative Capital Project Grant, New York Percent for the Arts Commission, Art Matters Grant, New York Foundation for the Arts Award, the Lambent Fellowship in the Arts and the Pennies From Heaven/ New York Community Trust Award, among many others. Biggers is assistant professor at Columbia University’s Visual Arts program. He is a Los Angeles native, working and living in New York City. For more information, go to sanfordbiggers.com. “Celestial Navigation: a year into the afro future” is a year-long curatorial program applying an afrofuturist lens to art work by established and emerging artists including Isaac Julien, Biggers, Xaviera Simmons, Jeanette Ehlers (as part of “The Black Radical Imagination 2014,” curated by Erin Christovale and Amir George), Cristina de Middel and Cauleen Smith. In addition to the video projection series, this year-long program also includes co-sponsored events and exhibitions with the Community Folk Art Center (CFAC) and Light Work. For more information about forthcoming artist talks, screenings, panel discussions and other events, visit http://urbanvideoproject.com.